It’s getting harder and harder to write about Heirs mostly because I have the same complaints about the show every week and don’t wish to rehash them. Half the time, I don’t even know why I’m still watching it — the few scenes that I want to see are unbelievably short. For example, the scenes with Hyo-shin’s helicopter mother have the potential to really delve into an emotional and important issue. But, of course, the show doesn’t go there. I wouldn’t mind this so much if Heirs was committed to being just a teenage melodrama but Heirs takes itself so seriously that I don’t understand why it doesn’t explore these issues in more depth. Another arc that doesn’t get enough screen time is the sibling relationship between Kim Tan and Kim Won. It is a strange and fascinating dynamic, especially now that Kim Tan has been kicked out of the house. 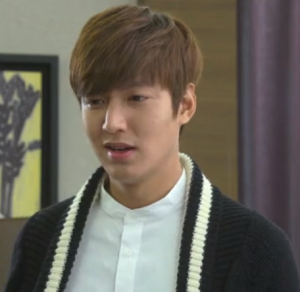 Will Kim Won soften up to Kim Tan? Or will it turn into a full blown battle between the brothers? If only this was the central premise of the show. Let’s be honest. If you were held in place by someone stronger than you, you would be afraid. It is NOT sexual tension. It is NOT romantic. It is creepy and controlling. Kim Tan’s barking of orders at Eun-sang also drives me up the wall. Kim Tan can be a nice and caring character so why are the writers doing this to him? Do they think that teenage girls like that sort of thing? Another thing Heirs is screwing up is Young-do. At his core, Young-do is a deeply flawed character full of anger at himself and his family. But that doesn’t mean he can’t grow and develop as a person. It’s been too many episodes without any development from him. Had the honest conversation between him and Rachel occurred a few episodes back, I might have had hope that he could change. However, for every step forward, he takes two back and I’m past being disappointed now. But, as much as I’d like to complain about Young-do, I think Rachel’s character development (or lack thereof) is even more troubling. While her mean side definitely adds drama — I was hooked during the Ye-sol bullying lunch scene — I don’t see a point to it. Rachel is smart. These episodes have proved that. So why can’t she see that Kim Tan is never going to want her? Even if she somehow managed to screw up his relationship with Eun-sang, he will never go to her. This also plays into the mindset of blaming the other woman. Rachel takes out everything on Eun-sang because she believes Eun-sang is the cause of all of this. However, Kim Tan made it clear from the start that he was never invested in their relationship. Furthermore, Kim Tan can make his own decisions so why Rachel chooses to blame Eun-sang is beyond me. Can’t we end this girl-on-girl hate? Heirs is becoming a chore to watch — so little good and so much blah. If Lee Bo-na and Chan-young weren’t in the show, I don’t know how I’d get through it. Here’s to hoping a miracle occurs and somehow transforms Heirs into everything it had the potential to be. Stray observation of the week: Is this the first time we’ve seen Choi Young-do’s hair not all gelled up? How will the revelation that Eun-sang is poor play out? Will Kim Tan fight his brother for stock shares?